In keeping with its yearly ritual, to celebrate the holidays and the New Year, Comme des Garçons has launched its Happy Holidays capsule collection. For this edition, Founder of the brand, Rei Kawakubo, has linked up with nine of the most coveted designers on the fashion scene currently, namely: Gucci’s Alessandro Michele, Burberry’s Riccardo Tisci, Maison Margiela, Jean Paul Gaultier, Walter Van Beirendonck, Simone Rocha, Craig Green, Marine Serre and Stüssy, to create an iconic piece from their collections to be recreated with a Comme Des Garçons twist. Each of these designers have come up with their own iteration of the popular Japanese brand, by introducing an iconic limited edition piece. The most common of these products have been a t-shirt, with majority of designers opting to play around the design for this transitional, staple piece. 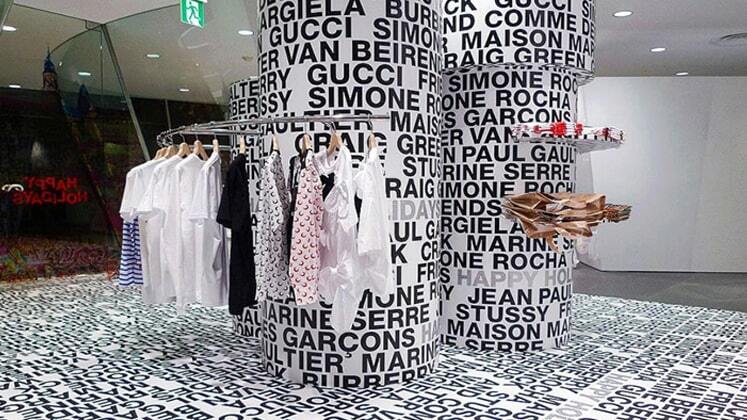 The collection includes a t-shirt by Jean Paul Gaultier, who has revisited his breton striped top with red polka dots, Tisci chose the famed Burberry tartan scarf and re-introduced it as an elongated neck tie that had the words ‘My Energy Comes From My Freedom’ printed down one side, and a Gucci shopper bag in plastic-coated brown paper featuring the brand’s famous green and red stripes. This collection marks the first time for Margiela to ever collaborate with another designer. Margiela’s renewed take on the classic white t-shirt that the OTB-owned label has released every year since Autumn/Winter 1994, supports the fight against AIDS. The collection has already made its debut in the Japanese market on 23rd November 2018, with the international release just underway, slated for a 5th December release.